Passing for White is book about two slaves escaping their masters. It is set in 1840s in America and has three controlling themes throughout the book: Racism, Slavery and Freedom. The book introduces to us our main characters Benjamin and Rosa setting them off on a suicide journey as they try to catch a glimmer of freedom. The book does a good job for its intended audience of young teenagers. As it introduces them to real world problems and edges them closer to reality (in racism and slavery) as it is based off a true story whilst still maintaining its action-packed and exciting plot throughout the story keeping the reader interested. Furthermore, it also educates young teenagers about what problems slaves faced in detail in 1840s especially the minor things. For example, them not being able to read or write since they were never educated eluded and surprised me as I was reading as this meant even if they reached freedom, it was hard for them to get a job. Additionally, the book also goes over the major injustice slaves received. An example of this in the book is one of the main reason Rosa leaves by being raped by her master. Moreover, the book connects the reader with the characters surprisingly well considering we cannot related to them. It does this by having few characters but developing them extremely well which evokes different types of emotions in the reader to the characters like sorrow and sympathy. 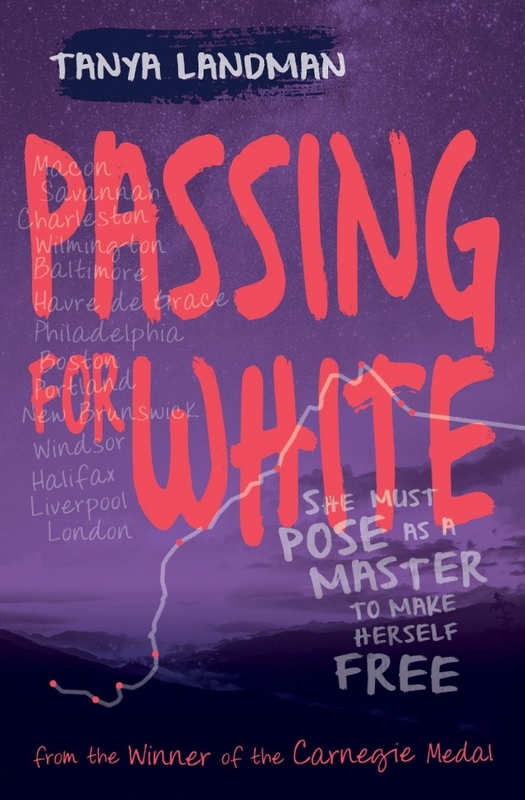 Personally, I think 'Passing for White' is an amazing book as it makes the read engaged in the book and invested in the plot of the book. All I wish was that the book was bigger, however, the shortness of the book makes the dilemmas more intense. I would definitely recommend this book to young teenagers but also adults. 'Passing for White' is a book that needs to exist in the way that it speaks of sensitive and important parts of history. Also there were a few good parts that I enjoyed greatly. However, the plot could have been much better and there was potential for a truly amazing book. My favourite parts of the book were the detailed description of the surrounding that really transported me into the setting. The plot was very spontaneous and random. Tanya Landman did not develop the plot twists very well and often confused me due to hurriedness of the book. I would give it 2.5 stars out of 5 stars. 'Passing for White' is an emotive and intriguing novel about two American slaves, planning their escape to freedom. The book is full of mysterious cliff hangers to keep you reading too. The plot was well planned out and left me wanting to find out more about the subject once I had finished it. My favourite parts of the book included when they arrived in Boston. As the read, the diary-style format made you feel as if you were on the journey with them, and all the stress and every bump along the way was communicated in such as fashion. I thought the downfall of this novel was the disappointing lack of character development. These incredible characters have so much true to life potential that is the key to making this a truly lovable read. At the beginning we are introduced to two characters which we never find out much of, which is disappointing. I would give this book 3.5 stars out of 5. The plot follows Rosa and Benjamin, two slaves on the escape, trying to get to north to the American states that have abolished slavery. Rosa having pale skin is able to pass for Benjamin's master. At the start we see what working as a slave is like for the pair, and towards the end and the middle, what life is like for escaped/freed slaves. There is nothing but trouble ahead for them and so many impossibilities to overcome but they still have hope. The story is about courage, working hard, inequality, doing the impossible and having faith. Rosa is the story's main character and we see most of the book from her view point. She is pale skinned as she is mixed race (black and white) and is often mistaken for being white which is where she gets her inspiration for her plan. She is brave, strong and very clever to be able to come up with the plan she makes and get away with it. Benjamin is her husband, but we don't get very much character development as the book is so short. The story is set in mostly 1848 in the USA on the east coast, at the time slavery was still practiced. Our main characters travel up the coast trying to get as far north as possible and maybe even to a different country. It does help if you know your cities and states on the east coast as you won't have to keep referring to the, very useful, map at the start of the book. The settings play a big part in the plot as people in the north and south react very differently to the main characters. The book is brief in some ways it is a good thing, it's a quick read, but I feel like this plot deserved a lot more than 103 pages to tell such as an incredible story and to fulfil its potential. However, it does still manage to give some insight into the lives of domestic slaves but does leave out the farming. Just because the book was too short for the plot and it didn't do well being crammed into so few pages. Is there a special place or character or event you particularly liked or thought was good? : I really liked Rosa because she is brave and determined, especially when she dresses up as a man. Do you think the history is realistic? : Yes. If you enjoyed the book, why? : I enjoyed the book because I didn't get bored and it was very engaging and made me want to read more. What do you think about the history in the book? : I thought that the history was very realistic. 'Passing for White' is a heartwarming tale of two slaves who fall in love and have to go on a death defying journey of freedom. In my opinion this story is not factually correct. Slaves may have been raped as Rosa was, they were given away as gifts. However it would have been very uncommon for them to have been allowed to marry and although there is a good reason that they are, if you tried to run away you would not have gotten away with it just because you covered your face in bandages. Because of this, I do not believe that this story should win and as the Historical Association you should agree that if it was not factually correct it should not have even been nominated. I really enjoyed thius book and really got hooked into the story. I read the whole book in one day due to the way the story was told in a straightforward but interesting way. The characters are both really brave and it helps you feel sympathy for all the terrible things that happened to them. This book definitely made me want to find out more about the history surrounding it, but also made me want to read other books by the author. Overall I would rate it 8/10 and would definitely recommend it. I really enjoyed this book for many different reasons. One thing that really stood out to me was that it gave a realistic picture of what black people had to endure during slavery in America. The book was based on the true story of Ellen and William Craft and their attempt to escape slavery. The book has definitely made me want to learn more about slavery and at times made me angry at the way they treated Ellen and William. The author mentioned at the end, that some of the graphic parts were only added to make it more of a story and did not actually happen in real life. Another highlight for me was the author's description, she described the characters feelings and events thoroughly and it really inspired me to use more description in my own writing. The book was able to show and give me insight into what it was like to be black during those times. It gave me a clear understanding what it was like for slaves in America, which was clearly not very good. I would be interested to read similar books about slavery even though at times it made me very angry with the way slaves were treated. I would definitely recommend this book to other readers especially those who are interested in this time in American history. This book is based on a true story of two people called William and Ellen Craft who were slaves in America's Deep South in 1848 and tried to escape.Â This was quite a short book and I would have liked it to be longer as I felt myself get more involved with the characters, the plot was over too soon. There could be another book about the next stage of their lives. I found this an easy book to read but it made me sad and angry at the same time to think about how people were treated.Â In terms of learning history about what was happening then it was helpful and it made me think this is something I am looking forward to learning about in year 8 history lessons. I would recommend this book. I think girls as well as boys in year 7 might like it. Rosa was a very confident and determined despite the way she had been very badly treated by her owners, and times she also had to encourage her husband as well. She was realistic about the problems they faced and what she had to do. Benjamin is a nice man and he and Rosa hatch a cunning plan to get away from their masters, there were also funny bits like when Rosa dressed as a boy and pretended to be deaf. This was an enjoyable short read which was very hooking. The story was tear-jerking and an accurate representation of the historical treatment of people of colour. Despite this, I personally thought that the plot was quite packed and therefore deserved a longer book written in more detail. In my opinion, the character development was lacking but the author still showed emotions very well and realistically displayed how people had felt. I enjoyed 'passing for white' because it was nail biting and when you thought all was going well, it had a dramatic turn. It is based on a black woman trying to escape from slavery. It was fascinating and once I read the first chapter I couldn't put it down. This certain book wanted me to read more of Zind Newbery's books because it was such a good read. It describes the cruelty of slavery and the treatment of black people. This book helped me learn how black people were treated and how horrible it was. This book has realistic history and made me think it through. It also has opened my mind. I really enjoyed this book because I found it very inspirational about the slave trade in America in 1848. Rosa really inspired me because she had the courage to cross America pretending to be a man. Rosa came from an awful past being a slave, separated from her mother, but through all that she still saw the light and she continued to fight for freedom. I think the history in the book could have included more information about what life for slaves was like. The story focusses more on Rosa and Benjamin's story and doesn't teach you much about what life was like. Reading the book did make me want to find out more about why some states allowed slaves and others didn't. I did enjoy the author's style of writing and I would read another one of her books. Tanya Landman is a British author, known for her books, Buffalo Soldier, Mondays are Murder and Hell and High Water. Many of her books are about a person from a different time period, or different place, as seen in Passing for White, which is set in America's Deep South, 1848. It follows a slave girl called Rosa, who was unique for her pale skin, and many thought was in fact white. She has considered escaping with this advantage in the past, but would never actually act upon her thoughts. This all changes when she meets fellow slave, Benjamin. I find this book gives readers a different sense of times of slavery. Yes, it is in first person of the slave, which has been seen in many books. But on Rosa and Benjamin's adventure, you almost feel like you're there with them. You feel the fear that they fear, you feel the relief they feel; all at the perfect time. Although at first, Passing for White didn't grab my attention, it is, in fact, a type of book I could not put down for long. I was always left wanting more. And although some parts are difficult to follow, I love this easy-read book. In terms of historical accuracy, I think this book succeeded. Books based in times during slavery can be difficult to get right, I believe. Obviously you want to accurately display the racist terms and thoughts many people had back then, but you don't want them to come across in an offensive way. Landman has got the balance perfectly right, if you ask me. She includes many of the derogatory terms used back then, to give us a sense of what it was like, but in no way at all does it come across in an offensive way. The way the places are (slightly) described in this book are done very well. It is easy to imagine what it would have been like. The characters in this book also add to the brilliance. Rosa is what you would expect of someone back then, but she is so passionate and caring, you canâ€™t help but immediately like her. Though the first chapter is from the perspective of Benjamin meeting Rosa, the majority of the rest of the book follows Rosa. From this, we see every part of her. The scared, the happy, the worried, the sad and the relieved (as well as many more). I think this is the type of thing readers want with a protagonist. You want to see them at their highest and their lowest, to feel like you really know them. After reading Passing for White I was honestly sad. Rosa was such an inspirational person, and it felt like there was a bond between herself and the reader. Not only was Rosa a great character, but the relationship between her and Benjaminâ€™s was truly beautiful. You could tell that they really loved each other. They hated being apart and were constantly worrying about each other, but it made them happy, which is what they needed in a time like that. I also love the message behind this book. 'You can achieve anything when you're with the one you love'It may seem cheesy, but I feel that it's perfect. And the way it's shown throughout the book really adds to the message: sometimes you doubt it, sometimes you have full faith in it. Without a message, a book is nothing, I believe. And this book perfectly captures that. The message really sticks with you for a while after reading, which makes Passing for White really stand out. To conclude, not being a frequent reader of historical books, Passing for White really stood out for me. It constantly kept me on edge, and although some parts could have used more description, I believe this is a small masterpiece.